I hit the books this week - making a few projects that have been on my "to do" list, made out of books! The first project was a book tree. I was a little discouraged to start this project as I knew it involved paper folding. I have not been able to paper fold much of anything successfully. Paper airplanes - no success with that one yet; Origami - I need a lot of assistance; Tea folding - ha, ha, ha, I won't comment on that one. Yeah...paper folding is not my forte, so I wasn't sure how this "try"al was going to go - but it turned out to be easy and fun. Let me show you how I did it. 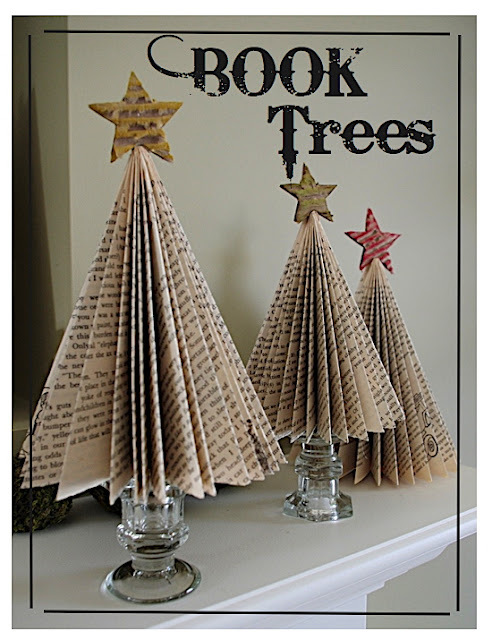 First of all, I read a tutorial on how to make a book tree. I found it on Kayla Amiee's blog - CLICK HERE to see her tutorial. I will let you go see her tutorial on how to take the book apart and get an idea on how she made her book trees. I wasn't sure how big a paper back I should use. The book I used had 230 pages. It takes 60 pages to make a full tree. With one book I was able to make three trees, and I had some book pages left over to do some other crafts. After taking the book apart and cutting off a section of thirty pages, start folding the pages. 1. I am showing you how to fold the book pages using a newspaper. Go ahead and practice on one to get the feel of it. 2. Fold the right hand corner down to the center. Your book page is more rectangular - so the right hand corner will not reach the bottom of the book like pictured here with the newspaper. Once you have done the first fold, take the bottom right hand corner and fold the page over to the middle. 3. The page will extend beyond the book. 4. The folded page needs to be flush with the unfolded book bottoms. 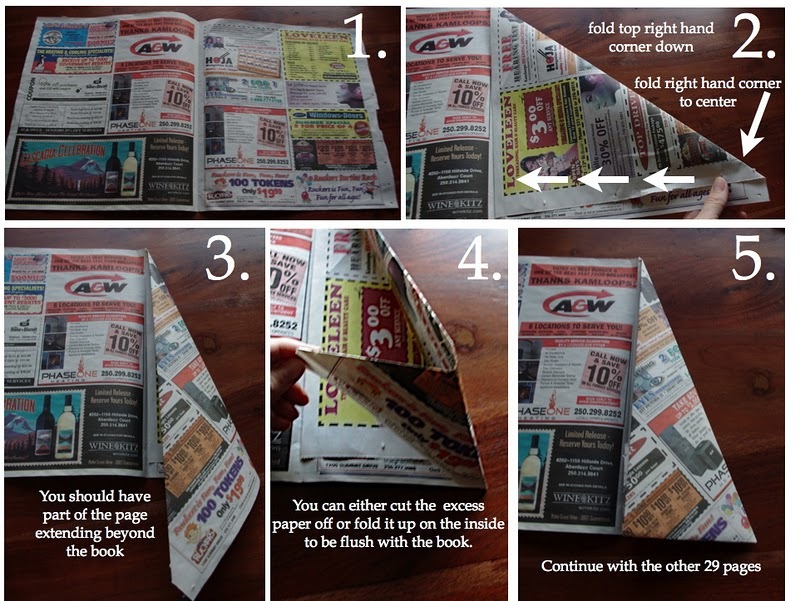 You can cut the excess folded book page off or fold the excess upward. 5. Continue on with the rest of the book. Once you have finished the thirty pages - you have one tree half. Make the other half. Run a strip of hot glue down the spine of the tree and adhere both halves together. *FYI* - I trimmed two of my trees at the bottom so that they are all different heights. I trimmed 3/4 of an inch off one, and 1 1/2 inches off the other. I trimmed them while they were in the "half" stage. 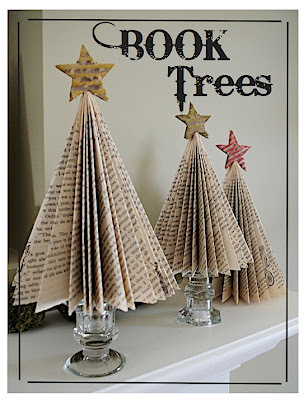 I have pinned a book tree that was displayed on pretty candle holders. It was very pretty so I did the same thing - only I used smaller candle holders. I made my stars out of cardboard, inked them and hot glued them to the tops. These are definitely on my list for this Christmas. Love them. so cute, love your blog and the name!! clever! I would LOVE for you to link this up at my link party, Once Upon a Weekend on my blog Family Ever After. The party just started! I am so pinning this right now and making them soon! These are so cute! Today I made 2 Jack o lanterns and was thinking about trees, now I don't have to figure out how, you did it for me! So cute!!! I'm pinning this for sure :) The stars on top add a nice touch! Amazing! I would have never thought of this! Have added you to my pinterest, I hope you don't mind! 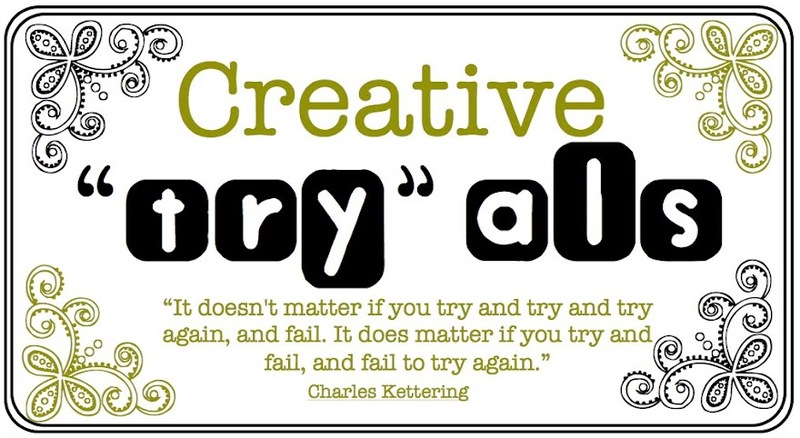 Thanks for linking up to the Creative Genius Link Party! I'd love to see you link up again tomorrow! I'm so glad you linked these up last week. They're being featured tonight! Come grab a featured button! Love these! You make it look easy - I'm also paper challenged, but am going to give it a try! These are awesome! I love them - I think they would be awesome with some silver glass glitter! These are so cute but I have a question. Do the pages need to be attached to each other like shown with the newspaper or can they be a single page? If they need to be attached do you fold in the other side also? I feel like I am missing a step but I have not tried this yet so it might make sense if I was in the process. Thanks for the info. @misspooh8 When you dismantle your book to 30 pages - then you start folding each single page. The first one you start with will be a single page, then when you flip the page it will look like the newspaper shot - only the left side will be the one you just folded. Before I started I was hesitant - with questions like you had - but once you start I think you will figure it out. I hope this helps!!! This looks great. I tried the book pumpkins for fall and these would be my next attempt. Thx for sharing! Oh man.. I might sound like the hugest design snob ever.. but I absolutely hate that font. Bleeding Cowboy is not an awesome font.. Awesome!!! I am home sick so making these are keeping me from going nuts and helping me get in the spirit!! @ tayfife, "Different strokes, for different folks". It's so funny that you hate the font so much and took the time to share. I was scrolling through the comments only because I LOVE the font and wanted to find out more about it. Lucky for me that you're a design snob and know the name of the font, I have already downloaded it and I look forward to using it soon. Thanks! Good for you! I love it too! Now I just need a couple of books to make these!! They would make an awesome addition to my gift baskets!! When I was a girl in Brownies....way long ago....we made these with Reader's Digest, too :) We then spray painted them gold and silver. I love these. So pretty. We made them once but spray painted all of them and they were really cute also! What an awesome idea for something a little more neutral amid a sea of green and red! I can't wait to give this a shot! Thanks for the idea! How did you attach the trees to the candlesticks? Hot Glue? Hi Nancy! I just had the trees sitting on there with a little bit of tape so I could use the candlesticks later, or change up the trees if I want to. I did get the candle holders for 50 cents each so it would be an option to hot glue them on. I used to make those out of Readers Digest when I was a kid. Hi! I glued a cork to the bottom of the tree and placed it in the candlesticks so I could reuse them. Thank you for asking!! I didn't think to include it in the tutorial. I have already tried it and it is wonderful and looks like a vintage one...me and my daughter enjoyed making it so much!!! !